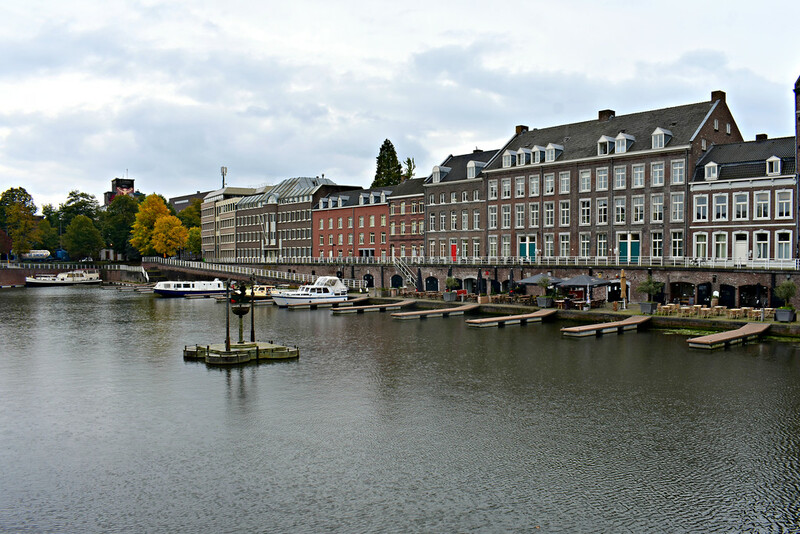 Maastricht has a clean, compact city center that is a pleasure to walk though. The narrow cobble streets, beautiful churches, and remaining fort walls are seeped in history and waiting to be explored. 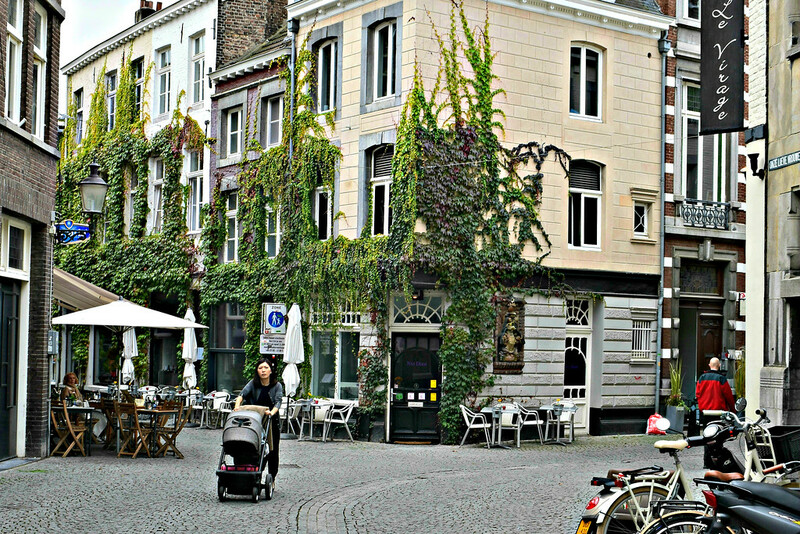 A lively atmosphere is felt on Maastricht’s numerous shopping streets and squares. The astronomical number of quality restaurants available in this tiny provincial capital means there will be something for even the pickiest of foodies. Enjoy a beer in a number of brown Dutch bars in Maastricht and you’ll find yourself rubbing shoulders with friendly locals. This city has something for everyone. Maastricht is an ideal destination for your next city break, romantic getaway or solo trip. If you arrive by car, consider parking at Prins Bisschopsingel, a partially covered car park under the N278 South of the city centre near the Stadspark (city park). Located a five minute walk to the Helpoort. Day parking is available for six euros! Maastricht is a 2.5 hour train ride from Amsterdam, The Netherlands or Cologne, Germany. Aachen, Germany is an hour away by train and bus. Train connections from Brussels can take less under two hours. Coming by train? Then simply follow this walking guide backwards as this self guided tour ends in Wyck. From the parkade at Prins Bisschopsingel, walk North along the Sint Pieterskade street parallel to the Stadspark, where locals can be found out for a stroll among the leafy environment. The Southern bastion, built during the 16th and 17th century, and the decorative fountain in the lake will soon come into view. Walk through the arch entrances in the fort wall and the street becomes Begijnenstraat. Turn right onto Vijfkoppen street. There will be a path on your right just before you walk over the Jeker river that takes you onto the bastion itself. Returning from the bastion cross over Jeker river and around the bend you will find the the 13th century Helpoort (Gate to Hell). There is a small, free museum two floors up inside the fort gate if you’re interested in learning more. The door will be on your right once you through the gate. 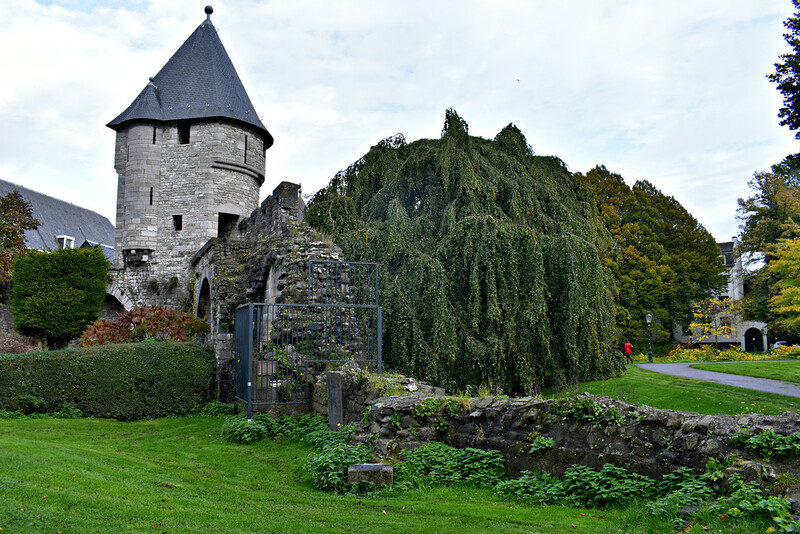 The Helpoort is a great starting point if are interested in the city’s former fortifications as you can along the attached Onze Lieve Vrowewal walls. From the Helpoort follow the path West of the gate for a short detour to Pater Vinktoren ( PaterVink Tower) a second medieval fortification tower built in the 14th century in response to a rapidly expanding city. Tout à Fait – A Michelin Star French cuisine restaurant with a modern ambience and exceptional food. Witloof– Stellar restaurant with delicious Belgian food, over 400 types of beers and 160 genever flavours. Immensely popular with locals and visitors. Cuisinier Toine Hermsen – A fine dining restaurant with a few Michelin stars under its belt. Beautifully presented, delectable dishes in a welcoming atmosphere. Alternatively, you could take Achter de Oude Minderbroeders street, walking along the North side of Catholic church Oude Minderbroederskerk, and emerge facing onto restaurant lined Sint-Pieterstraat. Rubs shoulders with locals and professionals at the popular Franco-Belgian pub resturant Cafe Sjiek, known for their Zoervleis, a regional meat dish from the Limburg province of which Maastricht is the capital. Hop off Sint Pieterstraat and onto pedestrian lane Lang Grachtje where you can walk alongside city’s oldest walls. Take a seat on the terrace outside Café De Pieter on warm days or enjoy the cozy atmosphere in the interior of the brown bar in cooler weather. Amble along Lang Grachtje passing Dutch homes with overgrown plants clinging to fascades and pause to admire the adorable tables for two outside the house situated at the intersection with Sint Hilariusstraat. Walk to the end of Lang Grachtje or take a shortcut with Sint-Hilariusstraat to join up with Tafelstraat (table street) looping back to Sint Pieterstraat. Head North on Sint Pieterstraat then turn into Stenenburg and pop into the Bisschopsmolen bakery. The Bisschopsmolen bakery produces their own flour from the water mill at the back of the shop and then uses it in their freshly made products. You can freely watch the water mill in action with the water wheel rotating outside transferring energy to the moving gears inside. The star attraction here are the Limburgse vlaai, a speciality pie consisting of a pastry and filling from the region of Limburg, of which Maastricht is the capital. Along with delicious pies you can buy freshly made bread, biscuits and cakes. Take a break from walking and sit down in their cafe. They serve breakfast, lunch, drinks and snacks throughout the day. You can also participate in a baking class and gleam the secrets of the famous Limburgse vlaai or stay a night at their B&B, or as they like to call it, the Bakker & Bed (Baker and Bed). Next continue onto Koestraat, another excellent street for food and drink options. Sit a spill at the Tea Zone, a tea room with a vast list of tea choices or grab a drink and a bite at Rumours on their terrace and people watch. The plants growing on the outside fascade of the buildings lining Koestraat are slowly but surely taking over. Onze Lieve Vrouwebasiliek or Our Lady's Basilica. The Onze Lieve Vrouwebasiliek is a Roman Catholic church dedicated to Our Lady of the Assumption and built in the 11th and 12th centuries. Adjacent to the basilica is the 13th century chapel Mérode chapel where the entrance to the church can be found. If you like you can light a candle for your loved ones in the chapel before entering the church. The interior of the church is dimly lit so give it a minute to let your eyes adjust. Inside put some coins in the box that turns on the lights at the altar to admire blue frescos. Then turn around and look up at the baroque organ showcasing colourful detailed religious scenes at its sides. A quiet, peaceful respite from the bustling city. The Onze Lieve Vroweplein or Square of Our Lady is a popular square with numerous cafe and restaurant terraces servicing locals and visitors. In fair weather the centre of the square overflows with tables shaded beneath canopies. On the first Sunday of the month, 4 Star Hotel Derlon on the square opens the doors for visitors to freely view the Roman ruins uncovered in the cellar. At other times you’ll have to make a reservation to eat next to these ruins! Next up, head East to Stokstraat, a popular shopping street lined with boutiques and speciality shops. The clean, narrow cobble lined streets are a pleasure to stroll along and window shop. Stop by the Peitit Café Moriaan, self proclaimed as the smallest bar in the Netherlands. The interior the bar is indeed tiny and cozy but they also offer outdoor seating in the back to accomodate more people. At the end of Stoksstraat you can either head East to cross the Sint-Servaasbrug bridge or travel West to continue the city centre tour. We decided to head to the city centre first so we went west on Maastrichter Brugstraat then North on Keline Straat. After popping into the tourist information office for a quick visit and picking up a few brochures of interest, we continued on our way pausing only to admire the facade. Free walking tours depart from the visitors centre if you are interested in getting to know the city with a local’s help. Even though these tours are “free” make sure to leave them a tip at the end since guides work on earned tips. Private walking tours can also be arranged. 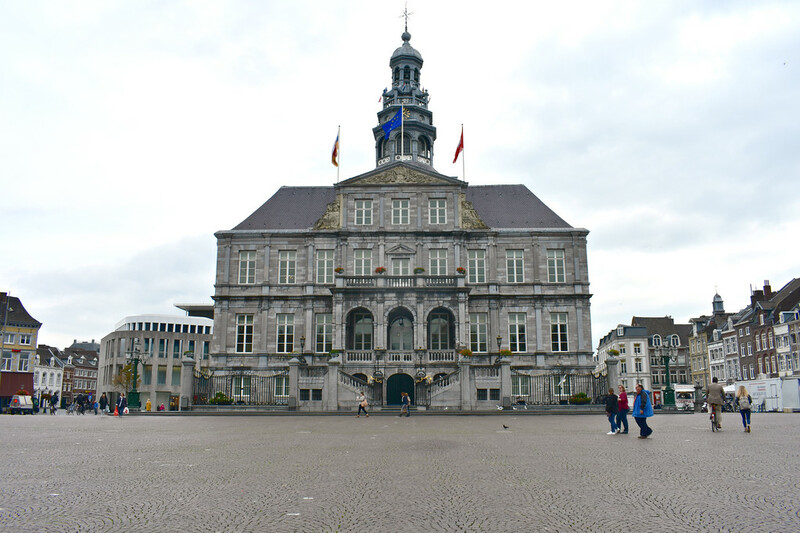 Now head North to the end of Muntstraat where you will come across the stately 17th century Stadhuis van Maastricht or Maastricht’s city hall. The Markt or market square that the town hall is situated on comes alive on the weekends with food and produce vendors selling sweets and treats, seafood, flowers and more. Numerous restaurants and cafes face the square and are great for people watching while sipping a Dutch beer. North of the Markt along Boschstraat you will find various Asian restaurants including the popular Pet Thai restaurant. They can make spicy food that will make your tastebuds explode. Heed their recommendations for spice levels or you will be extremely uncomfortable. This restaurant has produced the spiciest food we’ve come across so far in Europe. Continuing along Boschstraat, a few minutes North on foot will take you to the lovely little recreational marina, t’Bassin. It’s hard to imagine the factories that used surround this inner city harbour that is now surrounded by busy restaurants and cafes lining the docks. Come for a stroll along the clean waterfront or catch a show at the Lumière Cinema Restaurant Café. If you’re interested in street art, walk to the end of walk to the Eastern side of the t’Bassin and cross the street. You can find colourful graffiti on the south east walls C.V Landbouwbelang cultural building at Biesenwal 3, 6211AD. If you’re short on time, you could choose to skip this portion and head directly the the Boekhandel Dominicanen instead. Head to the Southwest corner of the Mark and walk to the end of Spilstraat. Walk West on Grote Straat until you find adjoining Dominicanekerkstraat. Ahead you will the lovingly restored 13th century Gothic Dominican Church is now repurposed as a bookstore, boekhandel Dominicanen. This is one of the most beautiful bookstores we’ve ever visited and they have a great selection of books to browse through. For coffee and pie visit the cafe at the back of the church and bring along your new book! After a leisurely poke in the books at Gothic Dominican Church, return to Grotestraat and continue West to the Vrijthof. The Vrijthof is a square hosting numerous events throughout the year including the festive Christmas market in December and concerts from Maastricht born André Rieu. We arrived during the rain to see the “church twins” of Protestant Sint-Janskerk and the Catholic Basilica of Saint Servatius. Look for the public art on the square including the Fountain Hawt uuch vas from Frans Gast and the bright carnival figures from lt’s Herremenieke by Han van Wetering. There are plenty of options for cafe and restaurants around the square, be sure to sit outside in fairweather. Excavations on the site of the Basilica of Saint Servatius have uncovered religious structures from as early as the 4th century B.C. The church is named after the Bishop Servaas who is believed to have been buried here. The present day church we can enter was likely the 4th church established on the site. To the back of the church walk through the arch entranceways and you will come across the treasury entrance of the basilica at Keizer Karelplein. There is a small entry fee to the basilica which includes a visit to the church, the treasury, the crypt below, and the inner courtyard. The Sint-Janskerk church or Saint John’s Church is a protestant church built in the 14th century neighboring Catholic Saint Servatius Basilica. It’s strikingly red-painted tower that makes it unique landmark and easily identifiable from afar. Free entry into the church and a small fee is present to ascending to the top of the 79m tower. Now that you have visited the basilica named after Saint Servatius, it seems only fitting to also visit the bridge named after this Saint. From the St Servaas Treasury entrance head East, rejoin Grote Staat and return to Maastricht Brugstraat. 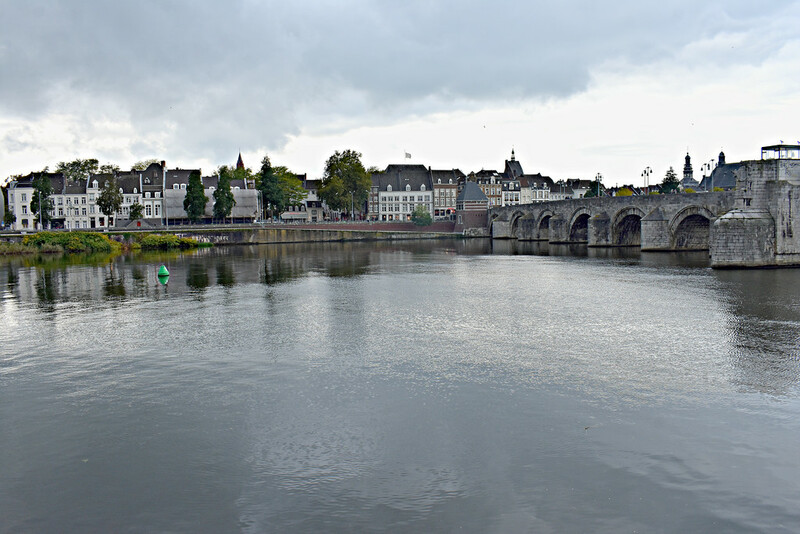 Leave the city centre and cross the Meuse River on the arched stone Saint Servatius bridge (Sint-Servaasbrug). In AD 50, a Roman bridge was built to cross the Meuse and remained in use until 1275. The present day bridge was built as a replacement and has been restored and heavily rebuilt following World War II. From the other side of the river, you have a great view of the city’s buildings by the water. Now is a great opportunity to visit the Wyck district that the bridge connects to. Walk through Oud-Wyck and you’ll find eccentric and artisanal shops and spaces ranging from galleries, bookstores, record stores, antique stores and various trendy boutiques . If you have a car available and you have an interest in Dutch windmills like myself, you could always end your time in Maastricht at the Tower Mill Of Gronsveld located at Rijksweg 90, 6228 XZ. 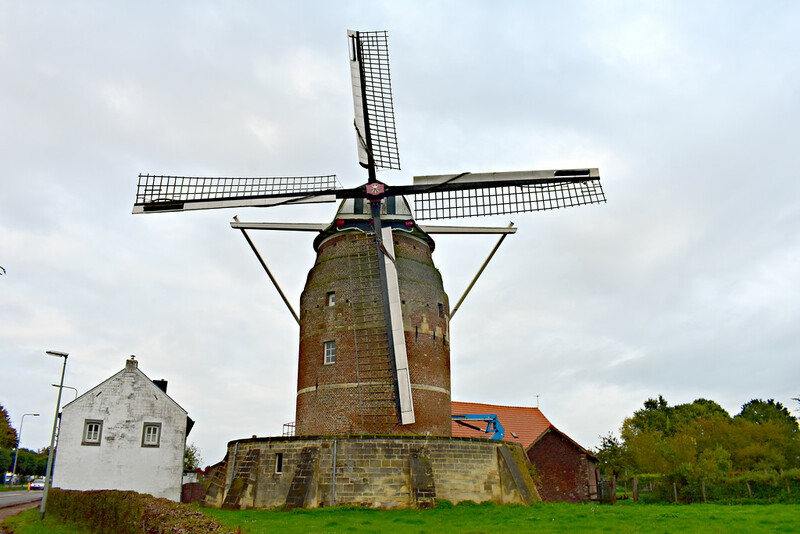 This working mill was built in the early 17th century and is the oldest in the Limburg province. There are cycling and walking paths nearby as well, but not much else. This time around we enjoyed walking and exploring through the city of Maastricht however next time we plan to visit the Caves in Zonneberg and Fort St. Pieter, and the Bonnefantenmuseum. The wine estate of De Apostelhoeve, the oldest winery in the Netherlands is also on my radar.See you next time Maastricht! Zoom in and out to look around the map. Click here to download the itinerary and have access to detailed step by step directions for offline use. We think the best way to experience and enjoy Maastricht is on foot. Even serial sightseers like ourselves relished the relaxed pace we maintained while exploring the city. Savour the time you have in this beautiful city. Aim to spend 1 or two nights to get the most out of your time. You can always come back another time if you fall in love with the city! Townhouse Maastricht– Expect bright airy rooms with cozy decor, quirky details, and a blend of modern and vintage style in this four star hotel in Wyck. Kaboom Maastricht–Hop off the train station and straight into your hotel room at Kaboom. Unwind in spacious, modern rooms or in the courtyard garden. When you’re hungry, journey downstairs into the adjoining restaurant and cafe next door. Backpackers will flock to the Stayokay hostel, a Hostelling International hostel within walking distance to the center center. Located on the banks of the Meuse river, enjoy the waterfront terrace in the summer or relax in the colourful common rooms. As a social couple who are interested in meeting locals but want our own privacy w e often look to stay in AirBnbs. You can sign up with a new account at Airbnb and get a $30EURO or $35USD discount on your first stay! Planning a Trip To Europe soon? Travel guides are not dead! If you want to plan your trip and your limited time effectively consider using a guidebook before and during your trip. The comprehensive guide books on The Netherlands from Rick Steves and Lonely Planet will help you discover the best of the country. Bring along the UnDutchables for some offline entertainment and gain an deeper insight in the Dutch culture for when you are lounging in your room, a coffeeshop, or during bus, train, car or plane journeys. If you enjoyed this post share with friends or pin it for later! Sign up for our FREE monthly newsletter for exclusive travel deals and reels, tips and advice, inspirational stories and ancedotes, and more! Appreciating the dedication you put into your blog and in depth information you provide. It’s nice to come across a blog every once in a while that isn’t the same outdated rehashed information. Great read! I’ve bookmarked your site and I’m adding your RSS feeds to my Google account.